1.Easy to use,just plug and play,no driver needed to install. 2.PCI-E connector use multi-layer shielded wire,can be connected at most 3M/9.84FT and will not weaken the signal. 3.The power cord uses pure copper to avoid burning line when mining. 4.Slot equips fixed buckle,which is more convenient to remove and fixed the video card,makes the video card not fall off the slot. 5.Suitable for all Window systems,LINUX and MAC. 6.Compatible with M2 NGFF KEY-M PCI-E slot of the mainboard. 1.This extension cable is suitable for the motherboard with PCI-E slot.Please plug in the floppy drive power cable when using.Make sure the computer is out of power when plug and unplug the PCI-E extension cable. 2.The cables inside are specially made. Please do not replace them with other cables. 3.Please recognize the direction when plug the line,do not insert inverse or offset position to prevent burning equipment. 4.Please hold the plug of the equipment and then plug wire to avoid excessive force to plug the socket pin. ➹➹ Build in 4 high quality solid capacitors provide reliable, stable and safe power delivery. ➹➹ SATA 15 PIN TO 6 PIN Cable can transfer the SATA 15 PIN power supply to graphics 6PIN power port,increase the graphics card current. 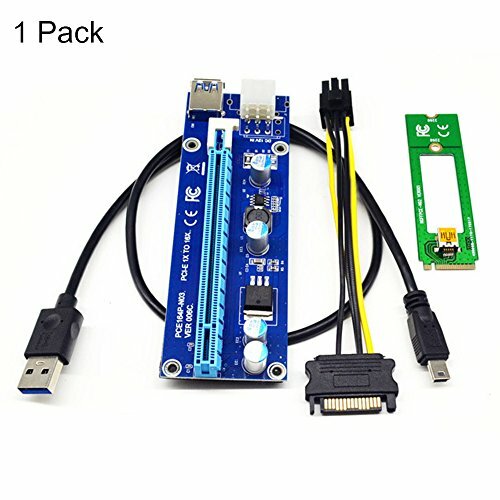 ➹➹ PCI-E riser adapter has graphics 6 PIN interface which can independent from the motherboard and reduce the burden on the motherboard when connected to multiple graphics cards. ➹➹ Come with 60cm/1.98ft USB 3.0 riser cable which is relatively soft,easy alignment and easy to install in the main box.It enables flexibility in the placement of PCI-E devices. ➹➹ Suitable for all Window systems,LINUX and MAC.Compatible with M2 NGFF KEY-M PCI-E slot of the mainboard. If you have any questions about this product by iGrace, contact us by completing and submitting the form below. If you are looking for a specif part number, please include it with your message.